Anytime is a good time for a burger! And just think. Not only will a discounted Fuddruckers gift card save you money but it will also get you one of the best burgers in town! Stop in and experience the taste sensation of 100% all-American premium beef, cooked to order and served on a freshly baked bun! Top it off with fixings from their legendary fresh produce bar, and you’ll have a customized burger you’re sure to love! But I’m not just talking average ordinary burgers here. They also offer hot dogs, chicken tenders, veggie burgers and more! Believe me; this place has something for everyone! And just think of the money you’ll save with a discounted Fuddruckers gift card! Same great food—less money—gotta love it! Founded in 1979, they specialize in huge hamburgers made from fresh on-site ground meat and freshly baked buns. As of 2017, there were 111 restaurants across North America with additional locations worldwide. Let someone else do the cooking and stop in today for a burger sensation you’re sure to love! And that’s not all! They offer salads, sides, creamy milkshakes, and more! 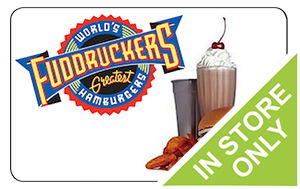 Purchase your discounted Fuddruckers gift card today and save money on your entire bill! At long last—you can eat the foods you love, without breaking the bank! Your discounted Fuddruckers gift card is your ticket to saving money on the food you love! And the savings don’t have to end there! Cards2Cash offers gift cards for lots of restaurants and retailers! Be sure to check out our listings for Red Robin, Five Guys Burgers and Fries, Ruby Tuesday’s, chili’s, and more! Living on a budget isn’t easy. We bring you as many money saving options as we possibly can! With Cards2Cash, saving money is a snap! Do you have a Fuddruckers gift card you aren’t going to use? Sell it to us! We pay top dollar for gift cards for many retailers! If interested, stop in one of our Cards2Cash retail locations for money on the spot, OR simply fill out our online form and we’ll get back to you with an offer for your unwanted card! Cards2Cash is your one-stop gift card shop!